We have had the great pleasure of having Mrs. Hartill's science class come out a few days the past few weeks and help us at the farm. Yesterday they helped us finish mulching our parsnips with straw we were defrosting in the green house. They turned a project that would have not been fun and taken one of us hours into a 45 minute joy ride. Plus they had time to shovel pathways for our laying hens to get to their 'sun room' low tunnel. Thank you! We had to put down one of our horses yesterday as a result of an escalating number of seizures and his obvious discomfort. With great regret, we had Tony euthanized by the vet and buried on our farm Wednesday afternoon. He's been a member of our family since 2014, when we were leasing the Bridge Farm. 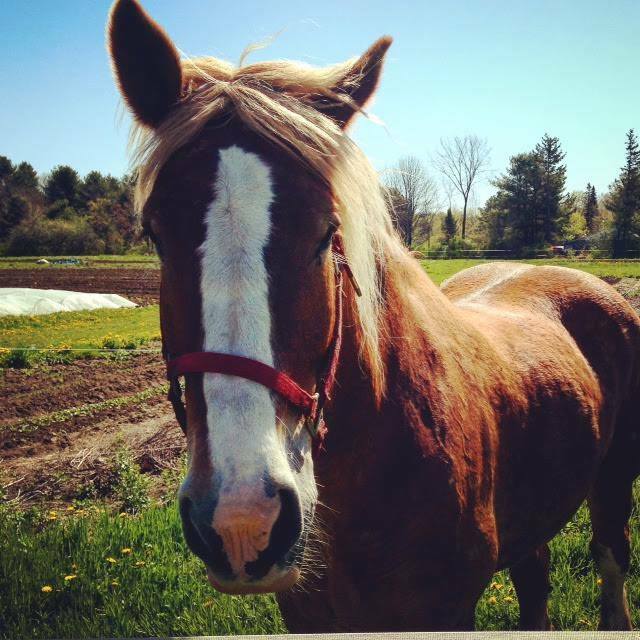 I still remember vividly the day I went to buy him from a horse dealer in Northern Vermont. He was big, beautiful, and powerful, yet quite steady in harness. Despite some hiccups in his first year with us, Tony grew to be a great workhorse. He was great to work with as a single horse and turned out to be a wonderful teammate with Jess - our remaining horse. I spent what amounts to hundreds of hours behind and with Tony and Jess doing the work needed to create the food you will be putting on your plate. Together the three of us plowed the approximately 4 acres on which our food grows with a walking plow last year. Together we subsoiled, harrowed, cultivated, spread manure, seeded cover crop, and harvested our heating wood on this farm. We hauled pigs, hay, and water. We even once went on a "camping trip" down the road at a neighbors' farm together. I didn't expect to feel such a great loss when Tony was put down, but it struck me how much of my time is spent in activities around the horses. It creates an invisible bond of mutual trust and dependence on one another. It is hard to lose him because he was a good worker, but also because the horses are a big part of our lives. We invested time into training him to become a productive work horse, into maintaining his health and comfort, and into creating a mutual relationship of trust. Without that trust, our relationship - just like a human relationship - does not work. One may ask why put yourself through the extra work and the inevitable pain of loss of a work partner? I wouldn't want to do it any other way. Empathy is an important virtue to us. Being in a rush or becoming engrossed in machinery or electronics tends to create distance between us humans and humanity. Our relationships with the animals extends our empathy for life and the health of the earth we depend on for energy, air, and water. The loss of Tony reinforces and punctuates our decision to grow healthy food that is less dependent on oil and more dependent on the lives of everything around us; humans, microorganisms, birds, insects, wildlife, and of course Jess and Tony. Wolf's Neck Teen Ag Crew came to visit! 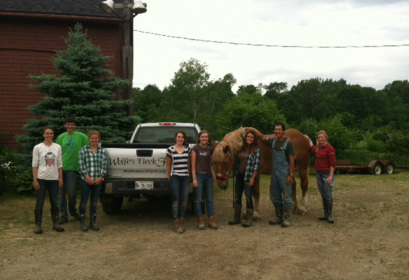 The Wolfe’s Neck Farm Teen Ag Crew is a great group of teens that spend the Maine growing season cultivating a foundation of skills vital to any small-scale farming operation. In addition to supplying much needed fresh, local produce to food banks in the region, this year’s teens will bring “produce to market” by filling veggie CSA. The Crew members also participate in educational opportunities around the state of Maine, visit and learn from local farmers, tour Maine’s food-relief systems, volunteer at food pantries and participate in leadership trainings. They helped us move hay bales under cover and weed our onions. Thank you very much! Our farm stand is open for business. In the first few weeks we mainly had our organic herb, vegetable and flower seedlings for sale, but as time goes on we have spinach, kale, lettuce and radishes. We are now keepers of bees! Ralph of Morning Star Apiaries brought us two hives. One hive has a native Maine queen, so hopefully they will be even more rugged and survive our harsh winters. Both colonies are very docile and have been multiplying quickly. We are looking forward to seeing them in our fields for pollination and honey later on. ﻿The students that came to our farm helped us paint our farm stand, haul brush out of the orchard, cut back some tenacious grape vines, organize and clean out our farm stand and harvest equipment, and saved our rhubarb bushes from a jungle of blackberry canes. Thank you very much for hard work and wonderful attitudes. We wouldn't have been able to do all that work without you! We were honored to take part in the United Way Day of Caring with the Richmond High School. The United Way partners with eighteen local schools and many area businesses to sponsor Student Days of Caring. 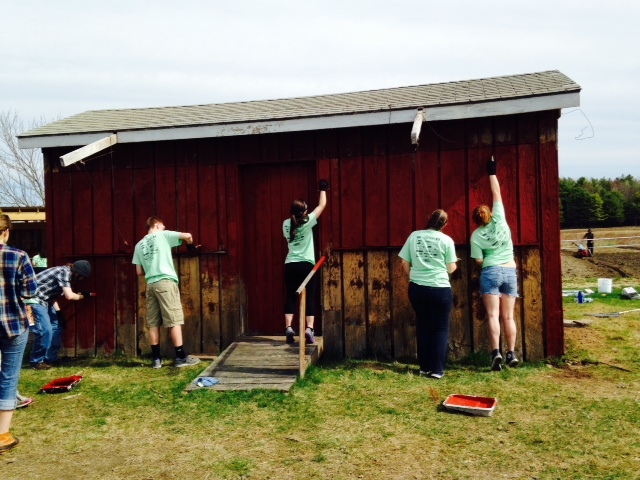 This annual event matches student volunteers with work projects at local sites in Southern Kennebec Valley. I LOVE having a green house! Our first year with a real green house and it is the only place I want to be. It is warm and green in here, even though there is still snow on the ground. 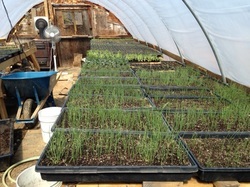 We are having a late spring but our onions, leeks, shallots, flowers, lettuce, mache, and dahlias are happy and warm! Our high tunnel is coming alive with spinach! Even some lettuce heads we had left for dead are reviving and looking superb. Can't wait to transplant our new round of lettuce into the tunnel. We spent a good part of the afternoon on Tuesday in the cozy house hiding from the 25 mile per hour winds of winter storm Juno- working on the last of our seed order, seeding schedules and field plans. It involved lots of catalogs, spread sheets, and seed packets- as well as hot tea and chocolate covered pretzels. The Blizzard of 2015 has come and gone- and left us 6 foot drifts of snow- conveniently located against our barn doors! -All 3 sets of our barn doors. We shoveled out the horse barn several times during the storm, and now that the winds have settled we can shovel out for good. We will free the chickens next- although I don't expect them to want to venture too far on the deep snow. This week Rich and our horse Jess will be at the MOFGA fair grounds teaching at the annual Low Impact Forestry Workshop. Rich will be teaching along with a dozen other teamsters at the Introduction to Logging with Draft Animals. Saturday, October 25th from 2-4pm we would like to invite you to join us as Ralph Lyden presents the wonderful world of honey and discus the amazing lives of the wonderful little creatures that produce this unique product. We will explore culinary uses of honey, as well as it's medicinal and healing properties. The afternoon will include a tour of the the farm with Rich and Kate and some delicious honey treats. Please feel welcome to bring recipes to share and questions to ask. We hope to see you there! Come see Rich working in the woodlot at the Common Ground Fair, Unity, ME! New Fall Hours for the Farm Store! The farm store here at 593 Gardiner Rd. Dresden is now open Wednesday through Sunday, 9am to 6 pm for your shopping convenience. Come by 5 days a week for your fresh vegetables, flowers, honey, maple syrup, pickles, books, and more. Our flowers are in full swing. We now have cut flowers at all of our markets, and at the farm store. We have bouquets as well as various cut flowers for you to mix and match to make your own bouquet. You can also find our flower bouquets at Ship's Chow Hall in Dresden. Want flowers for a special event? We do that! Call for pricing and availability. 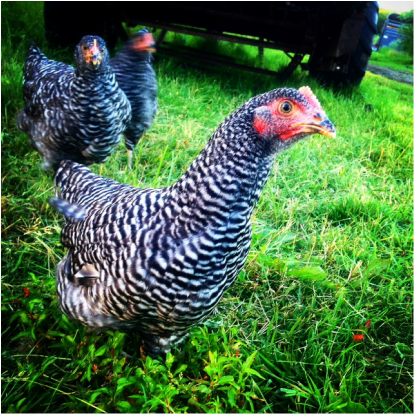 Our 48 Barred Rock hens are growing quick, but they still won't lay eggs till October. For now they are happy running around the barn yard, catching bugs and eating greens. They are great for keeping bugs down in the yard, as well as small rodents: I saw one catch a tiny vole today and swallow it whole! Our three little pigs are not so little anymore. They are getting BIG and cuddly. They let Rich sit on them while he scratches their bellies. They are enjoying the leftovers from our kitchen and any leftovers from the garden as well. August: Summer is in full swing. Our farmers' markets are going well and our tables are over flowing with everything from flower bouquets, beets, and carrots, to beans, cucumbers and garlic scapes. June 25th: The Wolfe's Neck Farm Teen Ag Crew visited our farm today to learn more about the ins and outs of farming with draft animals. 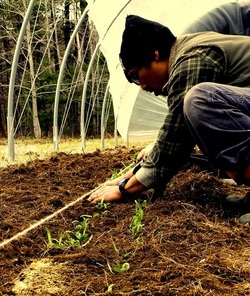 The Wolfe’s Neck Farm Teen Ag Crew spends the Maine growing season cultivating a foundation of skills vital to any small-scale farming operation. 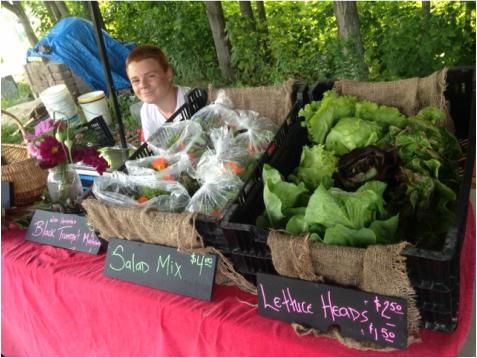 The teens supply fresh food to local food banks and run their own 15-share CSA. The Crew members also participate in educational opportunities around the state of Maine, visit and learn from local farmers, tour Maine’s food-relief systems, volunteer at food pantries and participate in leadership trainings. The four teens from Wolf's Neck and their two leads also helped us plant our summer squash and cucumbers and helped us pile up our loose hay in the hay loft! We got a lot done with their help and enjoyed learning more about their innovative program. We have been blessed to have several teamsters and horse whisperers helping us through our first days and weeks of plowing, discing, cutting hay, raking hay, getting harness to fit correctly, hauling hay up into the barn, cultivating crops and all of the other millions of big and little things that go along with figuring out how to farm with horses. We could not have done all this as safely, enjoyably, or quickly without them. We are eternally grateful and forever in your debt. Thank you. June 19th: Rich mowed for the first time with our team, Jess and Tony. We had the luck of being able to borrow our neighbor Bruce's John Deere #4 mower, and it worked like a song. June 21st: We brought in our first round of hay! Thanks to a crew of more than 10 friends and family, we had a wonderful day and got all the hay in. Some of the best hay we may ever make. We are putting up our hay loose, so we load it by pitchfork onto the hay wagon, then drive the wagon to the barn. While others are pitching hay onto the wagon, someone else is continually walking on the hay to pack it down and stabilize the pile. We do the same thing in the barn to pack in as much hay as possible. Once back at the barn yard we shove the hay fork down into the pile of hay and lift up several hundred pounds of hay into the barn. Later on in the summer we switched to using a hay net which can lift up the whole wagon of hay at once. Once up in the hay loft, we have 2 people taking the hay fork out of the pile and moving the piles of hay to the back of the barn to make way for more. We have had 34 different people help us with our hay this year SO FAR, and that was only the first cutting. THANK YOU! We hope you had as much fun as us. June 14th: CSA Potluck to kick off our produce season! We had a wonderful afternoon full of sunshine, good food and great company at the farm. Bob H. gave us a fantastic tour of Bridge Farm with historical facts about the farm going back hundreds of years. Lucia gave us a tour of the historical garden which she helped create with Kathy C. and several other master gardeners several years ago. Lucia is helping me maintain the historical garden of medicinal and culinary herbs, plants used to dye wool and cotton, along with a beautiful 100 year old rose bush and peonies. 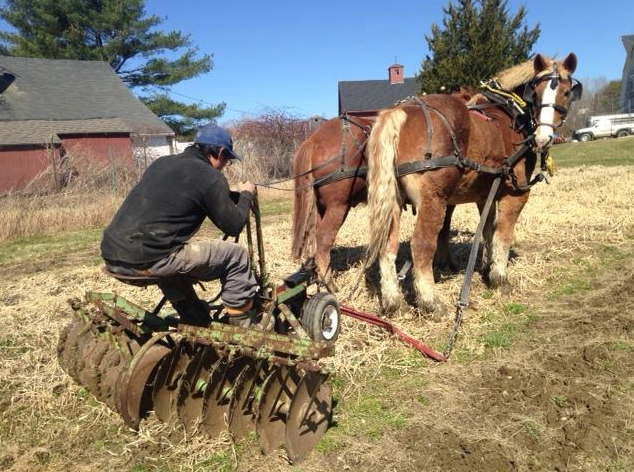 Here Rich is using a beautiful Wiard walking plow owned by Max Z. to plow up the cover crop of mustard we seeded on a newly tilled field on the hill. This is the first time Rich has been able to plow by himself- both directing the plow and the team of horses at the same time. Usually Rich is steering the horses while I am steering the plow, but now it only takes one of us to plow up a field, therefore saving us time and energy. 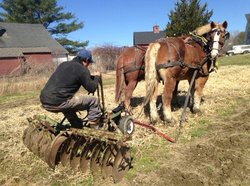 Today, in late April, Rich took our draft horses, Tony and Jess, to disc the farm fields that had already been prepped the year before. It was only the 2nd time we had hitched them together, and they did very well. Tony is proving to be solid in harness, very calm and attentive. Jess has a thing or two to learn from him. It's a good thing Jess is so adorable! It is his saving grace sometimes, as he acts more like a puppy than a one ton horse. 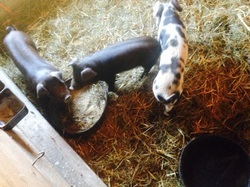 May 1st: We picked up 3 piglets from South Paw Farm last week. They are also taking shelter in the barn for now, but we will get them out on pasture this weekend when it rains. We also feed them chunks of sod for the probiotics and nutrients (along with their organic grain). We will be selling pork by the half in the fall. We are still looking for a source for organic whey- if anyone has any they are looking to get rid of in the area. 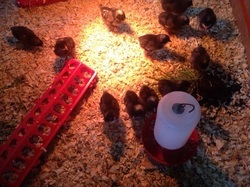 May 1st: We have chicks! We ordered 50 layer pullets and the mail lady was nice enough to deliver them right to our door! Our neighbor Tyler got some ducklings to keep in the pond and for eggs as well, so the young poultry are sharing a brooder in the barn. We are keeping them safe from cold and predators for now inside the barn, but giving them chunks of sod in the brooder which they devour. 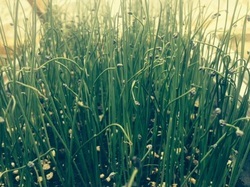 The sod helps give them micro-nutrients and pro-biotics. As well as some fresh greens and the occasional worm. The photos have a red psychedelic look to them because of the red bulbs from the heat lamps that we hang above them for warmth. Yesterday the whole family (almost the whole family- just missing Chris!) planted spinach in our new high tunnel. Now we just need the sun to come out so the spinach can get to work making chlorophyll and put on some weight. 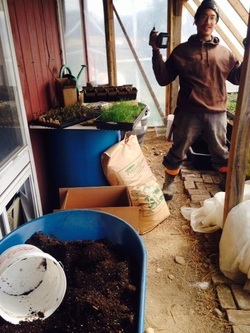 The greenhouse was quickly filled to the gills so Rich is working on constructing a cold frame. 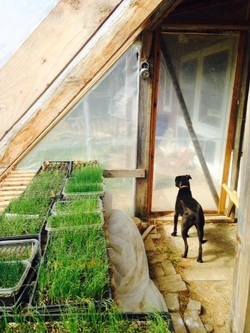 My sister's dog, Bella, came to help out as we have had some creature breaking into the greenhouse at night to nibble on kale seedlings. It hasn't been back since Bella spent a couple of nights with us as the Night Watch and new farm mascot. 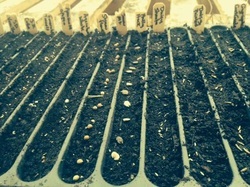 18 Different kinds of flower seedlings, including from left to right: Snap Dragons, Amaranth, Straw Flowers, Holly Hocks, Daisies, and Gypsophilia (baby's breath). It is a cool, dark spring but the greenhouse is green and warm(ish)! We have been busy planting MANY things, including LOTS of onions, shallots, cabbage, lettuce, spinach, zinnias, cosmos, thyme, lavender, lemon grass (! ), sunflowers, and more. We are applying for our MOFGA organic certification and making up road signs for the farm stand. My dad, John, has been doing most of our art work, signage, and any other artistic projects we need help with. We have seedlings! You can find our seedlings for sale at our farm store and the three farmers' markets we attend. We have vegetable, herb, flower, and perennial seedlings, including many different kinds of tomatoes, peppers, zinnias, snap dragons, thyme, lavender, lilies, onions, lettuce and nasturtiums. We are growing three different kinds of peas this year, sugar snap, shelling, and snow peas. Catch them while they last! They will be available May through early July.